Over the weekend, we visited my gparents in Bville. This equals visiting our favorite eating holes over the course of a few days. In the past, we have visited breakfast locations only a handful of times. But, on this trip, we went out for breakfast not just once but, twice. Double the pleasure, double the fun. For most at least. I’m not a huge breakfast fan. I am content with forcing myself to eat oatmeal or a wheat thin & peanut butter. On rare occasions, I treat myself with waffles or go on a cereal binge. But, overall, I stray away from most breakfast foods. I don’t do eggs and the smell of bacon is enough to throw me over the edge. Dilemma perhaps when it comes to what to order? Na, when your restaurant is named Cooks, you look at it one way – Now We’re Cooksing. We stopped by Cook’s on Saturday morning around 10:15am. Now, by this point in the day, I had been up for 5 hours & had already gotten a workout in. I had a bar around 8am and wasn’t crazy hungry. After reviewing the menu (and confirming I could not order lunch), I opted for a bowl of grits and a biscuit. Carbs anyone? Their menu was somewhat limited – unless you like eggs of course – but, I was happy with my order. After the longest 30 minute wait of my life, our food arrived. 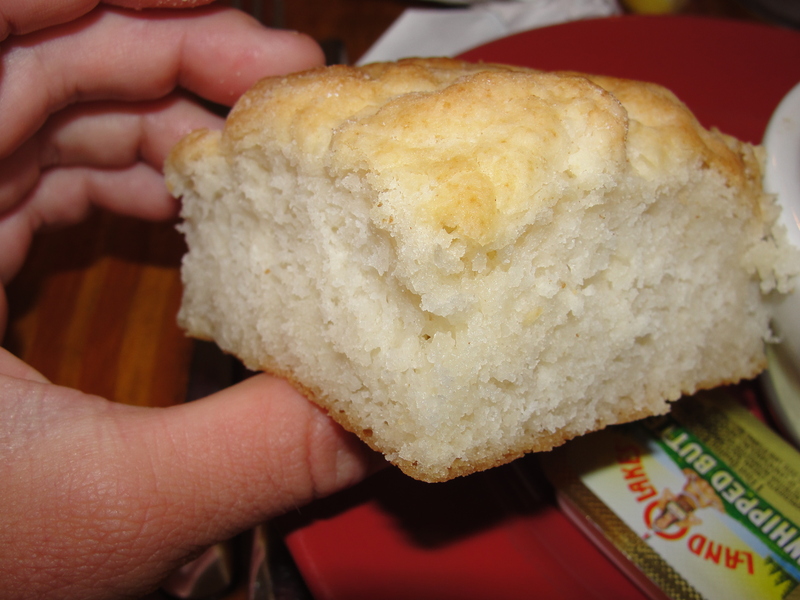 A nice bowl of grits and a large biscuit was presented on a plate to me. I am a fan of grits that I make at home. This consists of emptying the package, adding water and throwing in the microwave. The grits at Cook’s were homemade. I tried my first bite and found them to be extremely bland and flavorless. So, I added some butter & a dash of salt and pepper. After a few mixes, I tried the grits again. They were awesome. The butter melted into the grits and added additional creaminess to them. The overall consistency was just the way I like them – the perfect blend of thick & runny, with a soft feeling. The grits melted in your mouth and required no additional chewing. With the dash of salt & pepper, the seasoning was just enough to let the grits play their game. Mmmm. While I didn’t find myself loving the biscuit, I liked it enough to eat all of it. I found the biscuit to be pretty dry & almost, in a way, crumbly. I figure they make these on a daily basis so, perhaps I just got a bad one from the batch. The flavor of the biscuit was very, very thick and I only tasted hints of butter. I did not add any butter to the biscuit. Thinking about it now, grits and biscuits really don’t go together. This may have been another reason why the biscuit just didn’t do it for me. Even though the exterior was slightly crispy, and the interior was fluffy, I didn’t really feel as if this biscuit added anything to my meal. I would have been totally content without it. The rest of the family ordered egg dishes and, everyone enjoyed their meals. 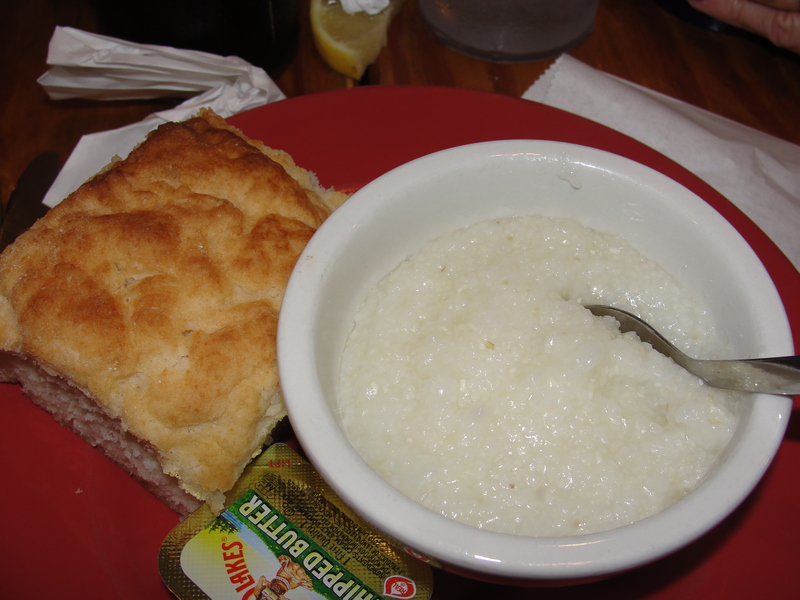 If we return to Cook’s, I will for sure order the grits again but, I will be passing on the biscuit. With the addition of butter, salt and pepper, these grits were some of the best I have ever had – perhaps the best ever, outside of the ones I make with Mike. As for the biscuit, I was expecting much more from a locally owned restaurant in the southern-mountain town of Blairsville. If you are in the area, and are looking for some good breakfast grub, check out Cook’s. Then, you too can say Now We’re Cooksing.